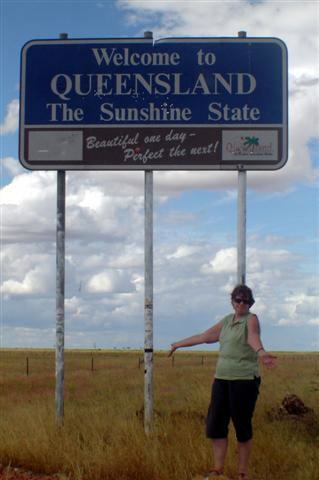 Camooweal, a stone’s throw from the Northern Territory border, is as far west as you can go in Queensland and still be in Queensland. We set off along the Barkly Highway one morning to visit this interesting outback town. The Barkly Highway stretches from Threeways Roadhouse, north of Tennant Creek in the Northern Territory to Cloncurry in Western Queensland, a distance of approximately 762 kilometres (474 miles) and crosses the mighty Barkly Tablelands, an area of over 100,000 square kilometres (38,610 square miles) of golden grasslands and some of the biggest cattle stations in Australia. An early start saw us get away from Three­ways at about a quarter to 8 in the morning. We had a long day in front of us with 442 kilometres (274 miles) to the Queensland border and from there another 12 kilometres (7 miles) to Camooweal. With only one night in there, we wanted to get in early enough to have a look around. Like all such roads in the outback, the Barkly Highway has some incredibly long, straight stretches of road. I can certainly see how easy it would be to nod off and, in fact, I did once or twice. We’d travelled almost 190 kilometres (118 miles) when we came to the Barkly Homestead Roadhouse, situated at the intersection of the Barkly and Tablelands Highways. The only roadhouse between the Stuart Highway and the Queensland border, the Barkly Homestead is a welcome sight. We stopped for a coffee break and to stretch our legs and after about a half hour were back on the road again. Along the highway from the roadhouse to the border there is nothing to see except the dusty red landscape; no towns, no houses, and very few people. We stopped at a lonely roadside rest area for lunch and it wasn’t until we were leaving that another vehicle pulled in. But by then we didn’t have far to go and we crossed over the border less than 90 minutes later. Of course, to me this was a photo opportunity that I wasn’t going to pass up and we stopped for a short while on the side of the road. Finally, with several photos in the camera, we were back on the road and arrived in Camooweal a few minutes later. Camooweal is the town that proudly declares itself as the ‘Gateway to the Northern Territory and Queensland’ and is reputed to have the longest main street in the world. 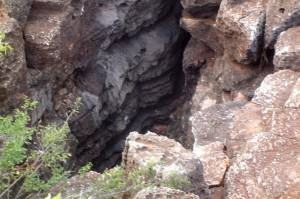 At almost 200 kilometres (124 miles) long, it stretches from the border to Mt Isa. The highway between Camooweal and Mt Isa is known to the locals as “Tojo’s Highway” because it was built during World War II with American funds and was supposedly the link between the southern states and the “front line”. We checked in to the Camooweal Roadhouse Caravan Park ([star][star][star_half]) and, after talking to the fellow running the place, decided to go and have a look at the national park. The Camooweal Caves National Park sounded interesting with its sink holes and caves and as it was already late in the day we knew we wouldn’t have too much time for exploring. I’d never seen a sink hole and a cave was where the bad guy always hid in the movies so I was quite looking forward to seeing the place. This whole district is honeycombed with sink holes and caves, some dating back to the Cambrian period, around 500-million years ago. There are approximately 80 confirmed caves, the majority right there in the National Park, and an aerial study conducted in the 1970’s revealed possibly 67 more. The caves are not accessible to visitors but if you could descend some of the way into them and explore, I wonder what secrets these ancient landmarks would give up. What stories would they have to tell? Another unsealed road! Oh joy! The National Park is 13800 hectares (34100 acres) and is roughly 24 kilometres (15 miles) from town. Most of the way the road is unsealed but not rough and our passage was marked by the great plume of red dust that we left in our wake! I was glad that we didn’t have the van with us; I am so tired of cleaning dust out of every nook and cranny! There were definitely no worries about parking at the caves; our car was the only one there. John and I walked over to, and around, one or two of the larger caves but there are plenty of warning signs advising people to stay away from the edge as it’s not safe. They were warnings that we definitely heeded. Some of these sink holes are 75 metres (approximately 250 feet) deep and you really don’t want to fall in one or have the edge crumble from under your feet. Something like that could totally spoil your evening for you! There are three major caves in the national park, the Great Nowranie Cave, Little Nowranie Cave, and Five O’Clock Cave. 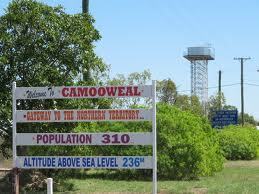 One or two others can be found in the Camooweal Town Reserve east of the town. 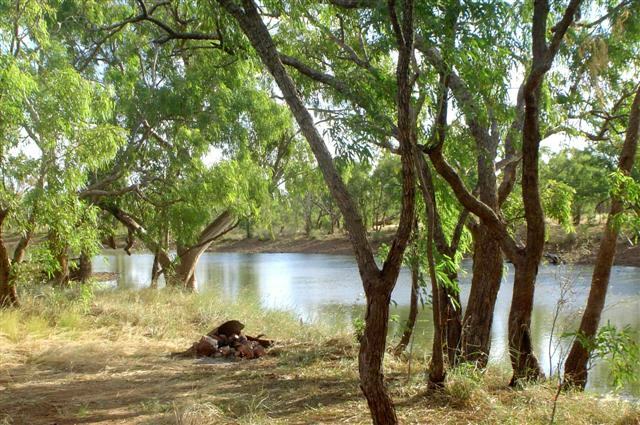 Nowranie Waterhole, a sparkling expanse of water! On our way back to camp we stopped for a few moments at the Nowranie Waterhole, 14 kilometres (8½ miles) from the park entrance. 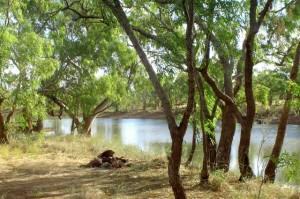 There is a camping area beside the waterhole and a couple of campers were already set up for the night. But the waterhole itself was a revelation. Surrounded by leafy trees and with the banks covered in green grass, it was absolutely beautiful. The water sparkled in the late afternoon sun and it was perfect. We considered ourselves lucky to have seen it like this; the campers were telling us that the waterhole has water in it for only a few short weeks each year, just after the wet season, and that within a couple of months there won’t even be so much as a trickle in there. A frog in the shower! The sun was setting and we didn’t want to have to try to negotiate an unfamiliar track in the dark so we took our leave of the waterhole and made our way back to camp. 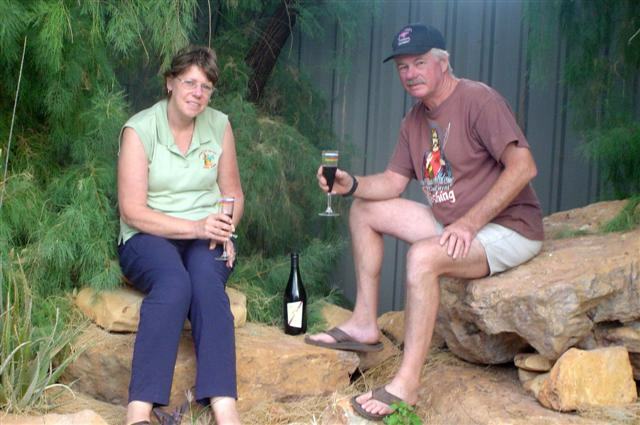 Our bottle of Two Tails Sparkling Wine was chilling nicely and we watched the sunset as we toasted a new caravan park in our first night ritual. It had been a long day and I was looking forward to a quiet evening and a nice hot shower. There’s something so relaxing about standing under the stream of hot water . . . that is until a big green tree frog landed at my feet! I don’t know who got the bigger fright, it or me! Needless to say, I figured if it wanted the shower so badly that it couldn’t wait for me to finish then it was welcome to it! Camooweal has a population of only 236 but even so, there’s still quite a lot to see and do. Given more time I would have liked to visit the Barkly Heritage Centre and Museum, where you can take a tour through the regions droving past, and the Riversleigh World Heritage Fossil Fields, the site of some of the most unique fossils in Australia. But it wasn’t to be this time. Perhaps next time . . .